Moving with children is difficult, because the move will seriously change your children’s lives. They will have to get used to new friends, a new home and new surroundings. For some, it can be unnerving, if not traumatic. Tell them early – Break it to your kids at a good time, but do it as soon as you can, so they aren’t surprised when it’s time to pack. Definitely don’t wait until the last minute to spring it on them. 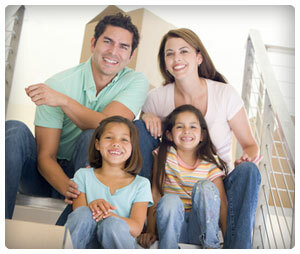 Give them a voice – If you haven’t already found a new home, bring your kids with you to “help” pick one out. If you already have a spot, let them choose their room or give them some authority to decorate. Explain what to expect – Try to fill your kids in as much as possible about the new town, when they’ll start school, what the climate will be like, and any other details. The more they know, the less stressed they’ll be. Also, try to really sell the positive characteristics of your new home and town. Move at a good time – If at all possible, move on a date that will give your kids a few weeks to get acquainted with your new home and neighborhood before they start school, such as during the summer or winter break. Moving day will rouse up a lot of emotions for your kids, and you won’t exactly be in the best frame of mind yourself to deal with them. So, plan ahead. Talk to your children about what needs to be done on moving day and their roles. For your sake, you don’t want you kids interrupting you while you’re packing boxes and loading furniture. Moving is dangerous. You don’t want to be lugging heavy objects around when you don’t know exactly your toddler is. If your children are older, you should try to involve them in the process. Have them partake so that they feel as though they have a role in leaving your old home behind. If your children don’t want to help, give them a break this time. Moving is a bit more emotional than, say, cleaning their room or mowing the law. Take them to things they like, like a baseball game or the movies. This will let them know that things aren’t all that different in your new town. Explore your new town with them. Take them for a drive, get dinner, get ice cream. Let them choose where to go. Keep them in contact with old friends. Perhaps even let an old friend visit, if practicable. Don’t pressure them. Don’t force your kids to do things right away. Let them get acquainted with the area for a few weeks before having them join clubs and the likes. However, when the time is right, activities will be the best way to really acquaint your child with your new home, so have some in mind.